It has been a while since I posted an update on my book progress…so here goes! I have been continuing to write and do research for my next book in the “I Was There…” series: I Was There When Jonah Was Lost. My goal is to have a completed and published book by the end of 2016. The research has been considerably more involved than I first expected. I have been busy studying ancient sailing and Phoenician and Assyrian culture around the time period of Jonah. The main character of the book is a Phoenician sailor from the coastal village of Sarepta who will be an eye witness to the famous account of Jonah in the Bible (see Jonah 1). Other characters in Assyria will witness the rest of the story (Jonah 3, 4). 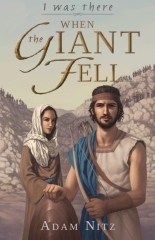 Just as my last book, I Was There When the Giant Fell, the story is all told from several 1st person points of view. I usually get up at 4:30 or 5 am and get in some writing time before the day begins. Recently I have started sending my book chapter by chapter to my editor, Rachel, and I am very excited to start the editing process again! I tend to be somewhat scattered in my approach to writing a novel, which means that I have many chapters of the story started and roughed in at this point while others are simply an idea on the page waiting to be fleshed out better. As I slowly work my way through the entire book getting chapters ready for editing the story is starting to take better shape. It is also amazing how many plot ideas and descriptions change and develop as I rework earlier rough sections. As always, I ask for you to continue praying for me and this writing project.